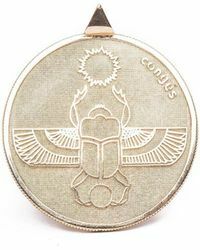 The Scarab Necklace with Champagne Diamonds by Conges. The 14kt solid yellow gold necklace is on a diamond cut chain with champagne diamonds. The total length of the necklace is 35 inches with a drop down length of 29 inches. Dazzling and intricate, this necklace makes a bold statement. About the Designer: LA-brand Conges was founded by designer Jasmine Penna, who was inspired to make jewellery that pays tribute to the stress-free serenity that everyone feels when they're on holiday. Jasmine's philosophy is 'think free, be free', and her jewellery is influenced by ancient wisdoms and artefacts. To find out more about the brand, please visit Conges.